Washington (CNN)– Toy gun grasped firmly in his hand and a grin plastered wide across his face while he played “Big Buck Hunter Pro,” Ryan Zinke could have been a kid at an arcade. 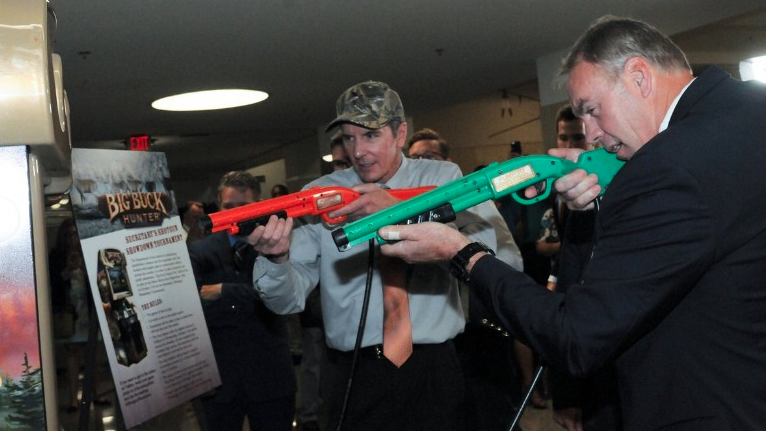 But the Interior secretary and former congressman was actually in the department cafeteria showing off the arcade game installed to commemorate hunting season. “To highlight #sportsmen contributions 2 conservation I installed Big Buck Hunter in the employee cafeteria. Get excited for #hunting season!” Zinke tweeted from his personal account Tuesday. But Zinke is not toying around when it comes to his support of hunters and fishers. Hunting in the United States is down. A US Fish and Wildlife Service survey released last week found that there are 2.2 million fewer hunters in America now than in 2011. And the new administration is poised to change that. On his first day in office back in March, Zinke issued two orders, one which overturned a recent ban of lead ammunition and fish tackle on Fish and Wildlife Service lands and waters. Last week Zinke issued another secretarial order designed to increase access to various public lands for hunters and fishers. Zinke’s passion for expanding hunting rights on public lands is both personal and political. A Montanan, the secretary has been known to hunt in his spare time. During his short stint in Congress, he was a member of the Congressional Sportsmen’s Foundation. He was spotted attending their annual dinner last Wednesday, a source told CNN, just two days before he issued the most recent secretarial order. Politically Zinke also owes a lot to hunting, angler and conservation lobbyists who were largely responsible for supporting him for the position of Interior Secretary earlier this year. The issue was especially important to Donald Trump’s son Don Jr., an avid hunter and active member of the Boone and Crocket Club, who helped with the search for Interior secretary. “Mr. Zinke was the pick of the litter, not the best litter ever, but he was definitely the pick and that’s why we advocated for him and that’s why Jr. advocated for him as well,” said Land Tawney, the president of the Montana-based Backcountry Hunters & Anglers, a non-profit sportsmen’s organization. Zinke and the Interior have recently made a big show of their support of hunting groups. In addition to the “Buck Hunter” game he gifted Interior employees, the department declared Thursday that October would be National Hunting and Fishing Month. The declaration also generated the support of the National Rifle Association. But despite Zinke’s clear efforts to woo hunters and anglers, not all of his decisions have gone over well with the conservationist-minded group. For example, Zinke’s leaked recommendationsto the White House to shrink the boundaries of national monuments and open up some of the land to the fossil fuel industry and loggers — first reported Sunday by the Wall Street Journal — were met with opposition and confusion. Conservationists who want to expand their access to hunting on public park lands and at monuments are as weary of opening up national park land to fossil fuel industries as environmentalists are, since both value sustaining the land as is. “We can have all the access we want to a concrete parking lot, but that access doesn’t mean anything if that fish and wildlife habitat isn’t there,” said Tawney. Another pro-hunting group says what they are seeing within Interior is a fight between access and conservation. “On the access front the department has been good. Access to our own public lands is a lot harder today than it ever has been, and that is in part introduced with the decline in hunting numbers we’ve seen,” said Whit Fosburgh, president and CEO of the Theodore Roosevelt Conservation Partnership, a non-profit coalition of conservation organizations and outdoor related businesses. Fosburgh said that the hunting community started getting “a little bit critical” of Zinke after he first announced the National Monument Review earlier this year. And he’s skeptical of just how far the secretarial order will go. Fosberg’s criticism is similar to what environmental groups said following the secretarial order last week. Nevertheless, Fosburgh said most pro-hunting and conservation minded groups are still hoping for the best with the Trump administration.